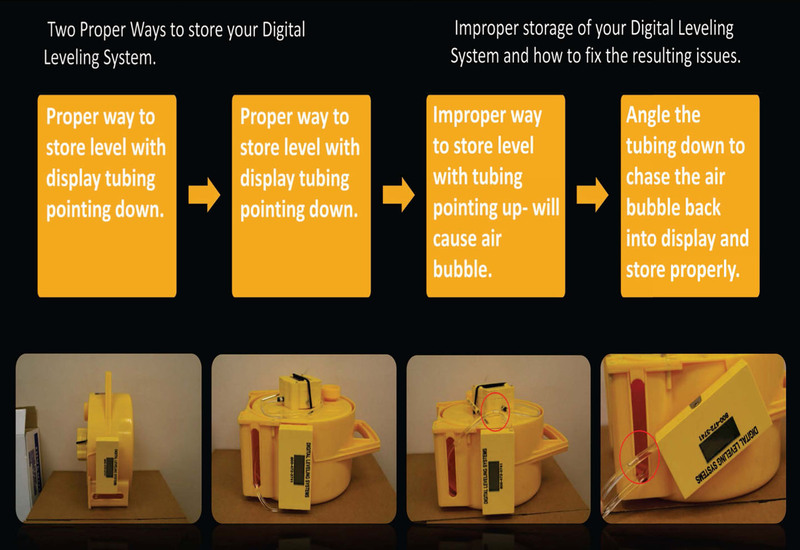 Storing your Smart Leveler digital water level properly will provide you with years of trouble-free operation. It is important to store your level with the display tubing facing down, either standing upright, or on its side, like in the diagram below. In the event your Smart-Level is stored improperly and develops air bubbles, follow the instructions below to remove air bubbles. There are two adjustments – zero and scale – for fine tuning the level. Set the reel on it’s side- reservoir remaining strapped onto the reel- and the display set flat beside the reel. Adjust the display zero screw to read zero. Adjust display zero screw till display reads zero. CAUTION: The 1996-2012 models use red RV & Marine Antifreeze only – active ingredient : Propylene Glycol. Use of any other fluid may void the warranty. Air bubbles trapped in the tube may cause slight variations with larger bubbles causing greater variations. A bubble 1/4″ or smaller (about the size of a pencil eraser) will generally not cause a noticeable problem. Larger bubbles should be bled out. Hold the display unit lower than the reservoir with the tube pointed down. Back the brass hex bleed plug out until all the air bleeds out, and then retighten the plug. Check the reservoir for the proper fluid level. If the reservoir is low, too full or has too much air trapped in it, the readings will not hold steady. The reservoir should be approximately 2/3 full for ideal operation. Back the plug out until the fluid starts to drip out and bleed down to approximately 2/3 full. The diaphragm must have room to expand to allow for temperature changes. If too much air becomes trapped in the line or near the middle of the tubing, the complete system can be flushed by following the instructions below. Remove the reservoir from the reel. Remove the reservoir cover and filler plug. Completely submerge the reservoir in a pail or bucket of RV antifreeze, with the plug hole facing up, with the pail 4 to 5 feet higher than the display. Remove the brass hex bleed plug from the bottom edge of display and allow antifreeze to siphon through the system as you would with a regular water level. You may need to raise the reservoir higher to start the siphon. It takes about 10 minutes to flush the entire system once the siphoning has been started. When all of the air has been flushed out, replace the bleed plug in the display and fill the reservoir as per the instructions in the section above. Replacement components can be ordered here.